New at Kohepets is the Feed My Paws range of pet treats. These are suitable for both Cats and Dogs. No preservatives or additives. All Feed My Paws treats are handcrafted in small batches. To ensure freshness for your pet, this treat has a shelf-life of 2 to 3 months from manufacture date. Made in Singapore. Yay! I believe in supporting local brands who are deserving. Exotic protein. Yes you get your fish and chicken treats (all fresh and wholesome) but they also have some very exotic meats such as frog and crocodile. Feed My Paws Frog Legs Cat & Dog Treats ($15) are great for pets with allergies against common proteins, recommended for pets with numerous food intolerances. The pack contains whole frog legs. It's crunchy and tasty for pets who love to munch. 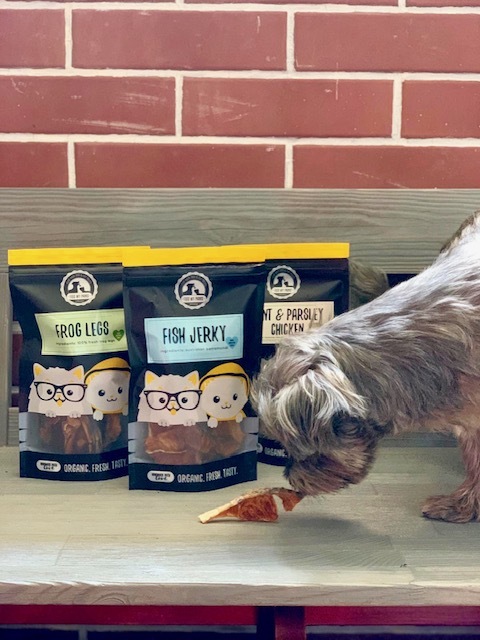 Feed My Paws Fish Jerky Cat & Dog Treats ($17) contains only slow-cooked (over 15 hours!) Barramundi without added salt or additives. You can snap these into smaller pieces. It has a light crispy texture. Feed My Paws Mint & Parsley Chicken Cat & Dog Treats ($14.50) is made with hormone-free chicken breast. It's chewy and tasty (seasoned with organic Mint & Parsley ). This lean protein supports your pet’s muscle growth and development. Head over to my Instagram @hollyjean69 . 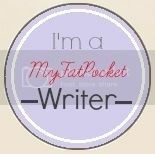 I have 2 packs of Feed My Paws Cat & Dog treats for one reader. What is the single ingredient in Feed My Paws Fish Jerky Cat & Dog Treat ? Tag one friend along with your answer in the comments section. Multiple tags are allowed, one tag per comment (but please don't spam friends who don't have cats or dogs ah). Winner will be picked randomly and announced on 18th April 2019. *Giveaway for those residing in Singapore only. Prize will be mailed to you. P/S- when you order your pet supplies from Kohepets, delivery to your doorstep is free for orders over $60. Here's what I ordered fpr Lola in my last haul: Treats from Feed My Paws, Schesir Chicken with Pumpkin Canned Dog Food, Bow Wow Zenith Soft Kibble, Really Pet Food Lamb Canned Dog Food (this is at $1 clearance! ), Monge Fruit Lamb & Apple Pate with Chunkies and Monge Fresh Duck Pate with Chunkies . 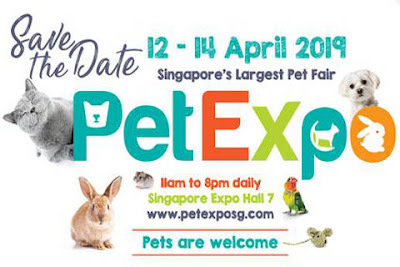 Pet Expo is this weekend from 12 to 14 April (Fri to Sun) at Singapore Expo Hall 7. Look out for Kohepets, they will have a LOT of new, fun and exciting surprises there for you, such as our new product launches, exclusive promotions, goodie bags and SO much more. Your pets are welcomed too!